Live video apps are all the rage and we want to help you use Periscope and Meerkat in your roofing business with these 4 tips. First, what makes these apps different than any other style of video? While that seems somewhat trivial, it makes a big difference because of the way you will talk and interact with the camera. Having a live audience (or even the possibility of a live audience) will make you speak differently than when you record a video for uploading later. At least that’s what happens to me. I’m more comfortable on camera making a quick (live) video to a few friends versus stressing myself out making something specifically for YouTube. First, you will need to download the apps onto your phone. Here are 4 simple ways roofers and roofing companies can start using live video apps like Persicope and Meerkat. This is not a new idea per say but one that is still not being implemented by 95% of roofing companies. Shooting with these live video apps will make this easier for you to do while on the run. When you first start working in a new neighborhood, you can shoot a quick ‘Scope (Periscope lingo for making a video) letting your followers and social media contacts know you might be in their area. This simple strategy is one of the best to demonstrate (DAILY) that you are the local roofing expert for their neighborhood. Periscope offers a setting to save each video you shoot to your phone. I do this and then you can upload the video to Facebook and run an advertisement to the zipcode you’re working. It’s a great way to remind people you’re in their area and prepared to help them too. Do you ever get on a roof and say “OMG I can’t believe those guys did this!” ? Take a video and talk about it. Show the damage and share how your company would do it better. One of the differences that homeowners can understand is quality of materials. Do you go and pick up supplies for each job or are they delivered to the job site? This makes a great Periscope for Roofers to show off that your company is using high quality materials. Once the roof has been installed it can be tougher to show the amazing felt you use or how your nails are galvanized. You know the differences that you make better than the competition. Show them off! Those are a few ways you can begin to use Persicope and Meerkat to market your roofing business. Join the conversation here on Facebook and tell us any ideas you have about using live video apps for roofers. 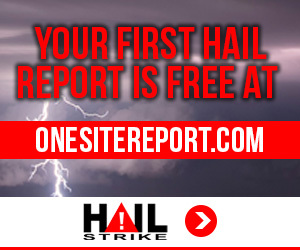 Are you a HailStrike member? If not, check out our pricing.